HONOLULU, July 10, 2018 /PRNewswire/ -- A jaunt to the beach, a quick errand or the drive to work. These activities just became more manageable for residents of Honolulu and visitors alike with today's launch of a creative new mobility solution called Hui – a round-trip, station-based car share service. Operated by Servco Pacific (Servco), Toyota's distributor in Hawaii, the Hui service utilizes Toyota's proprietary global Mobility Service Platform (MSPF) and a consumer facing app developed by Toyota Connected North America (TCNA), the global technology strategy business unit for Toyota. 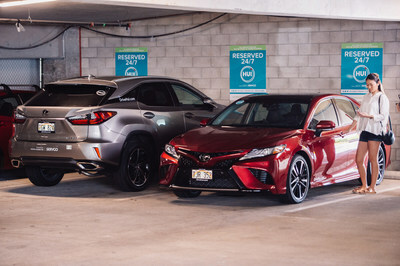 "We're really excited about Hui because it's a game changing way to offer car sharing," said Zack Hicks, chief executive officer and president of TCNA, and chief digital officer of Toyota Motor North America. "The program is simple to use and more convenient than a traditional car rental service – plus typical add-ons like gas and insurance are included in the reservation cost. And thanks to Servco's strong relationships with consumers and extensive knowledge of this market, Hui will be the most accessible car share service in Honolulu by far."